Now a days many companies pay TDS every month. 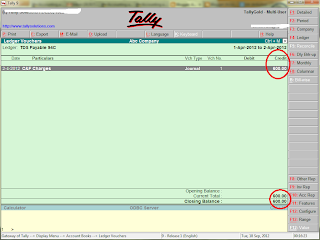 You can simply complete TDS Transactions in Tally. I hereby explain how to enter TDS transaction in tally and how to get Montly TDS Payable amount. Follow the following simple Steps. There are mainly 3 steps to complete TDS Transaction in Tally. STEP1: Create Supplier/Service Provider Ledger, TDS Section Ledger & Expenditure Ledger. 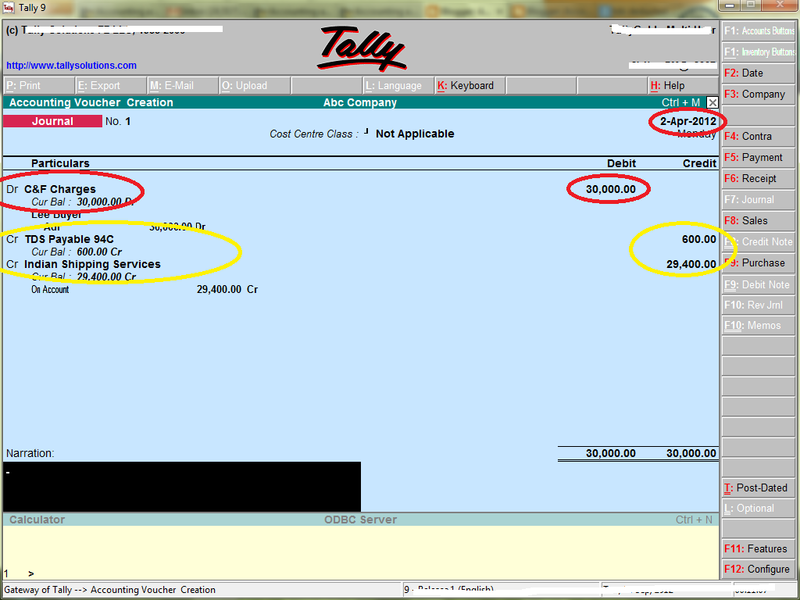 STEP2: Enter Invoice/Bill entry in Journal Voucher. STEP3: Get Total TDS Payable Amount for the particular month. 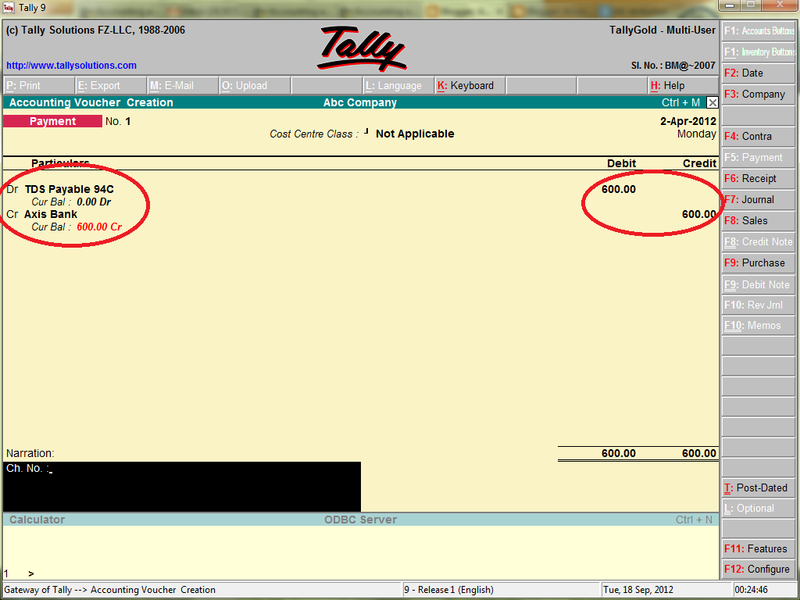 Eg: If you get Bill from M/s.Indian shipping services an amount of Rs.30,000/- for C&F Charges. In the above bill, you must deduct 2% TDS (Rs.600), and you will pay remaining bill amount (Rs.29,400) to M/s.Indian shipping services. In the end of the month you will be pay the TDS amount (Rs.600) to Income Tax Dept. -> Write Narration, then press Enter. -> Select Ledger "TDS Payable 94C"
Now you can see total TDS Payable amount for the particular month and particular TDS Section. Payment entry: After paid TDS Amount to Income Tax Dept, enter Payment entry. 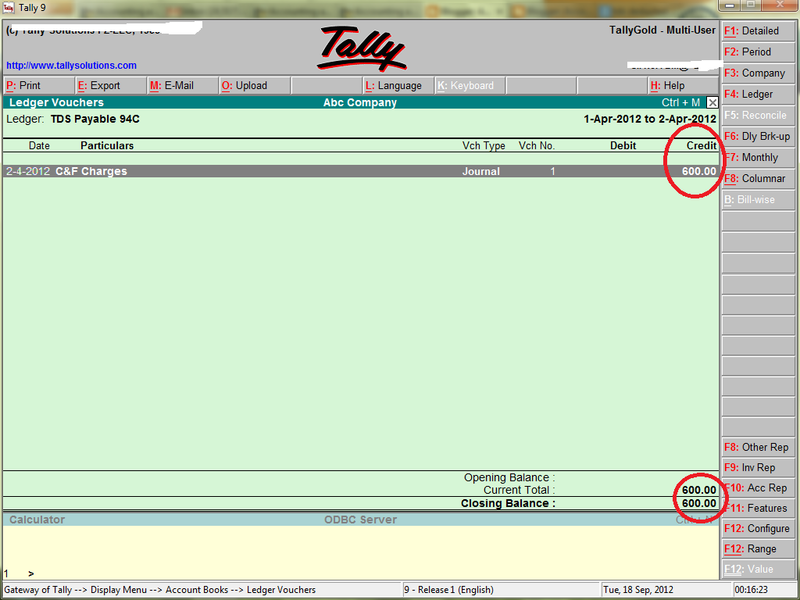 If you have not pay the TDS amount to Income tax Detp, the TDS Payable ledger shows credit balance. this is liability for the company. In the same way create all TDS ledger accounts based on your TDS deducted sections.